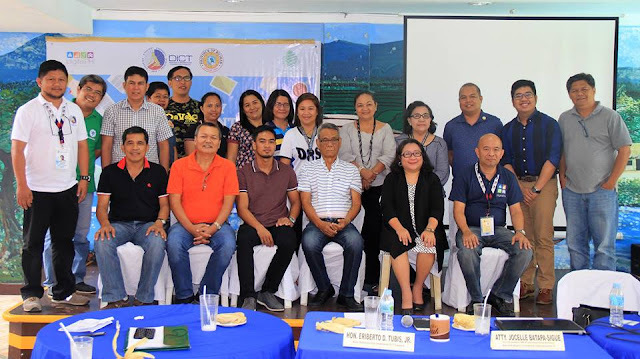 Officers of the Provincial Information and Communications Technology (ICT) Council of Biliran took their oath office last May 18 for the promotion, application, and improvement of ICT for community development in the province. Leading the oath is Biliran Vice Governor Eriberto Tubis, Jr. in the Municipality of Naval in Biliran and witnessed by Department of Information and Communications Technology (DICT) Director for Visayas Cluster 2 Antonio Padre and National ICT Confederation of the Philippines (NICP) Vice President Jocelle Batapa-Sigue. Batapa-Sigue, who is also president of the Philippine ICT Innovation Network, a private organization of ICT advocates, conducted a capacity development training for all the officers before the oathtaking. Batapa-Sigue lauded the efforts of Biliran in raising the level and participation of its stakeholders from academic, government and industry to maximize the use of ICT to uplift the economic situation of Biliran in Region VIII. Under an ordinance passed by the Sangguniang Panglalawigan of Biliran in March this year, the ICT council in close collaboration with DICT, the council is responsible in promoting the development and widespread use of emerging ICT, foster and accelerate the convergence of ICT and ICT-enabled facilities, to ensure the availability and accessibility of ICT services, and to provide support to agencies governing and regulating the ICT sector and ensure consumer protection and welfare, data privacy and security, foster competition and the growth of the ICT sector. The council is also tasked to support the DICT in promoting a policy environment that encourages a broad market-led development of the ICT and ICT-Enabled Services (ICT- ES) sectors, a level playing field, partnership between the public and private sectors strategic alliance with foreign investors and balanced investments between high-growth and economically-depressed areas and to promote and the development of local ICT content, applications and services which may include support for ICT-based start-up enterprises through strategic partnerships. The ordinance also encourages the ICT council to promote the use of ICT for the enhancement of key public services, such as education, public health and safety, revenue generation, socio-civic purposes, arts, tourism, and national identity. The DICT is mandated to ensure the rights of individuals to privacy and confidentiality of their personal information, to ensure the security of critical ICT infrastructure including information assets of the government, individuals, and businesses; to promote digital literacy, ICT expertise and knowledge-building among citizens to enable them to participate and compete in an evolving ICT age, and to empower, through the use of ICT, the disadvantaged segments of the population, including the elderly, persons with disabilities and indigenous and minority groups. The ordinance also creates the committees on research and planning, education and training, government support and investment and promotions.